This time of year, when PAX East is just around the corner, BrainLazy tends to get swarms of emails telling us about all sorts of neat stuff. We try to filter through it all and only put the stuff that really tickles our fancy onto the front page. That’s why, when the makers of Nanodots contacted us, it started a conversation among the BrainLazy staff. Do they make the cut? First we’ll need to go into what Nanodots are. In essence, they are a pile of tiny spherical magnets. All they want to do is stick to each other, but due to the unique properties of spheres and magnets, they can be coaxed into sticking together in complex geometrical shapes. Couple this with the fact that these aren’t just your average refrigerator magnets, but instead those fancy and super strong rare earth magnets we’ve all heard so much about, and you’ve got a building toy that the kids will never get their hands on because the mathematicians are too busy playing with it. Now, the question on our minds when we got the email wasn’t “Is this cool enough to talk about?”. Magnets are cool; building things is cool. Building things OUT of magnets is thus either double cool or cool squared, depending on your favored arithmetic operation. The issue at hand was, “Aren’t these just Bucky Balls?” For those of you not in the know, Bucky Balls are the other spherical magnetic building toy, and the similarities abound. Both are available in many finishes, including gold, silver, and black. Both are available at prices starting at $29.99, and you get 216 of them. 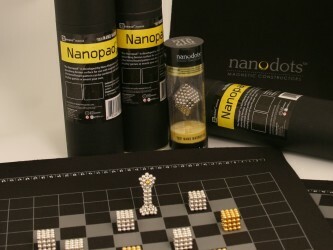 So what exactly sets Nanodots apart? Why should we talk about them? Well, the thing that sold me is that they seem incredibly dedicated to helping people build and showcase new and more impressive creations. Just check out dotpedia to see for yourself what people have been doing. Not only that, but they’ve got a pair of accessories in the works that will make things even easier. The first, available now, is the nanopad, an iron-ized fabric building surface that the dots are attracted to. 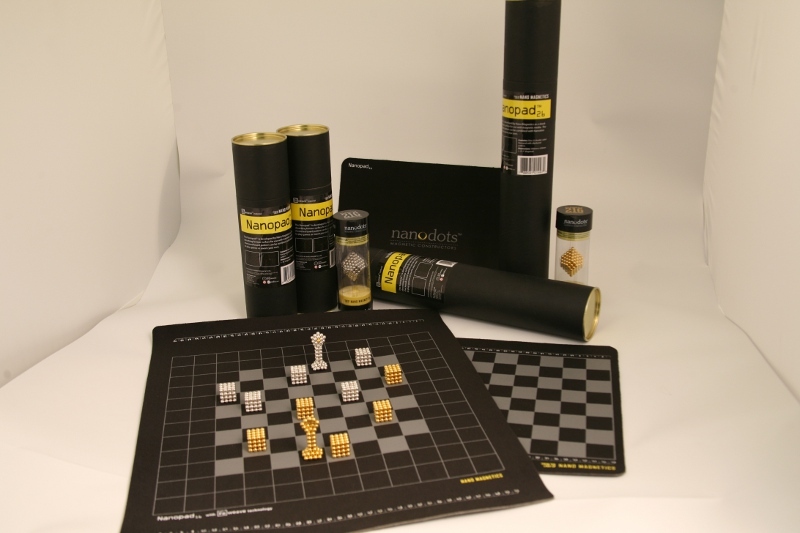 This will keep them from moving around, and even has a game board printed on it. The other gadget (scheduled for release later this year) is the MFV splitter card, which helps measure and separate the magnets and even visualizes their magnetic fields. Mostly though, we love the idea that even something so specific as “216 count metallic sphere building toy” could have room for competition. Competition is good. It forces people to up their game, to innovate and improve. So checkout the images below to see the nifty packaging and fancy new offerings, and if you like what you see, head on over to www.thenanodots.com and pick up a set.